Who is it for? Innisfree Jeju Volcanic Color Clay Mask Cica is suitable for all skin types. It is apt for controlling sebum and refining troubled skin areas. No. But discontinue to use in case of skin abnormalities after use. Apply an appropriate amount on a dry face and cover the problem areas, avoiding the eye and lip areas. After application, wait 5-10 minutes and rinse thoroughly with lukewarm water. Use it 1-2 times a week. This face pack comes in a pastel green squeeze tube with a brown flip-open cap. The simple yet elegant pack is practical and travel friendly. All necessary details are mentioned behind the tube. The product has almost no fragrance, which is a major plus for people who do not like artificial fragrance in their masks. 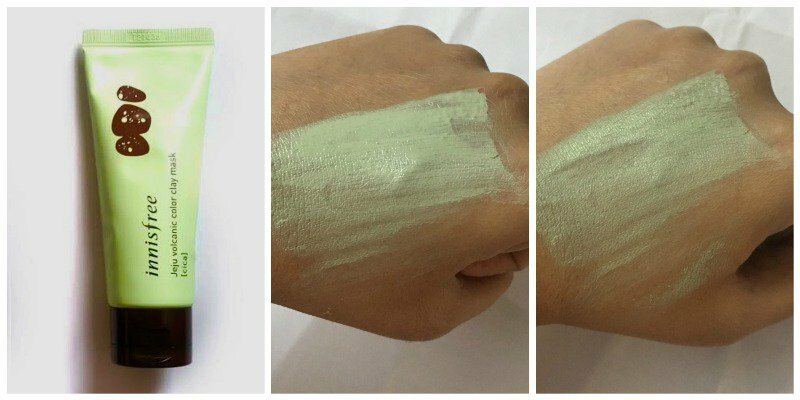 The face pack is pastel green coloured soft clay like mask which is thick in consistency but spreads smoothly on the skin. This product works amazingly well. I had read that it has Madecassoside that controlled sebum and that this mask refines troubled skin areas. So I applied it after washing my face and left it for15 minutes. The mask is smooth to apply even though it has thick consistency. After 15 minutes it didn’t feel like the mask was drying up and upon looking in the mirror also it seemed as if it hadn’t dried at all. But when I touched it, no product came on my fingers and the texture still felt smooth. I realised that unlike other clay masks it wouldn’t crack or dry up like mud. So I washed the mask. It rinsed off easily and did not cling to my skin. I pat dried my face and it appeared matte and free from oil and dirt. However, what I simply loved was that it did not over dry my skin or made it itchy and thirsty for moisture. I had acne when I used it and the mask did not irritate my acne like ordinary clay/mud mask (multani mitti) would do. Also, it dried up the acne to some extent. The face felt oil free and clear for quite long and all in all I was really pleased with the result. Doesn’t cling to skin or cracks up on the skin. Doesn’t over dry the skin. Travel friendly and practical packaging. Yes! It is definitely worth a try. Would love to buy other masks from this range as well. Innisfree Capsule Recipe Pack Volcanic Cluster – Good Buy ? Innisfree Capsule Recipe Pack Green Tea – Is Excellent!